The town of Breckenridge was originally going to use the F-Lot as the location for a new parking garage. But after traffic studies in the town, the council has started to move in a different direction. The discussion around a parking garage in Breckenridge has become heated once again after Breckenridge Ski Resort rejected a $3.5 million proposal from the town to buy the South Gondola Lot. In December, the town of Breckenridge offered to purchase the lot from the resort in the hopes of building a parking structure, with construction starting by April of 2018. The proposal also called for an agreement for first right of refusal for the North Gondola Lot, as well as the Gold Rush Lot, should the resort ever put them up for sale. However, in a Jan. 6 statement, John Buhler, the vice president and COO of Breckenridge Ski Resort, said the resort is not interested in selling its land to the town. Buhler went on to voice his continued disappointment with the council’s refusal to build a parking garage instead on the town-owned F-Lot. Buhler said the town all but guaranteed a parking structure on the lot if the resort declined to oppose a proposed $3.5 million annual lift-ticket tax, which passed handily in Nov. of 2015. Buhler has long been critical of the town’s decision to postpone building a garage, sending letters to pass holders at Breckenridge, as well as to the Summit Daily. The current proposal is a second attempt made by the town to create a new deal for parking in Breckenridge. Mamula said that the town had sent a similar proposal to the resort in August of last year, offering to buy all three of the ski resort’s lots for $10 million. The town never heard a counter offer from the resort. After the initial talks about parking in 2015, the town had hired a traffic consultant firm, Nelson/Nygaard, to conduct a study. The firm concluded that building on the F-Lot would add to congestion. The town looked at other options for lessening traffic, including paid parking in several of the town’s lots and major streets. Then came the town’s bid for a resort-owned lot for a parking garage. The South Gondola Lot already has 600 spots. A garage would add a minimum of 400 more spots. Shannon Haynes, the assistant town manager for Breckenridge, said that the cost of a garage is largely dependant on the size of both the lot and the structure, and whether or not there will be an underground level. She added that it’s cheaper to go up rather than down, and that a garage could cost anywhere between $35,000 to $100,000 per space. Under the failed proposal, the area would have been under construction for 18-24 months, leaving the town short a full parking lot. Haynes said that if the town does build a structure, they have parking available on Block 11 in the town, but that a plan would have to be put in place. Buhler disagrees that a garage in South Gondola Lot works for the town, or the resort. He added that the Gondola lots, as well as the Gold Rush Lot, are some of the most important parking locations for skiers in the town. 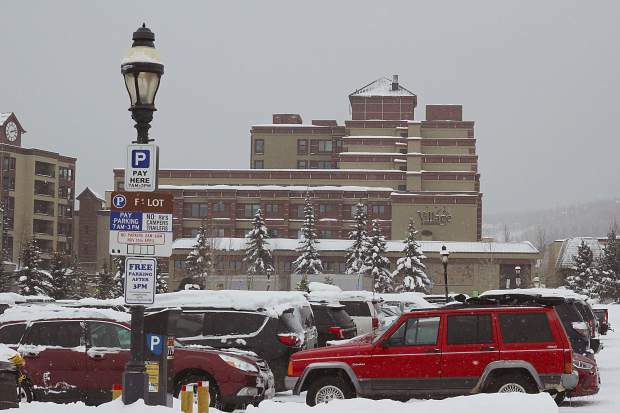 Wendy Wolfe, a councilwoman and mayor pro-tem in Breckenridge, said that the resort’s focus on skier parking is part of the reason for the clash. The town is responsible for locals as well as guests. With the increasing number of tourists in the summer season, she said that the town also needs to think of parking solutions for those visitors. Buhler has also continually accused the council of dragging their feet by performing additional studies on the traffic congestion in Breckenridge. In talks with the previous town council, Buhler said that a parking garage was promised for the F-Lot, and that traffic studies had already been done during the 2015 parking campaign. In past comments to the Daily, Buhler said that it was his understanding that the lift-ticket tax was supposed to go toward building a structure. “The plan has always been to build a garage on F-Lot in the town’s core, which was made clear in every article, every quote, every council record, every piece of campaign literature before the tax was passed by voters,” he said. However, Mamula disagrees, saying that there is no written record on an agreement to build on the F-Lot. He added that the rise in traffic concerns in Breckenridge has forced the town to think differently about how to solve congestion. “Things change, times change, new information comes to light, it would be wrong if this council went against several engineering studies now to appease what VR believes was promised to them,” he said. On Jan. 24, an engineering report on congestion and traffic patterns on Park Avenue will be presented during the town council’s work session. The session will start an hour early in order for the council to have more time for discussion on the study. The council will also hold a special retreat meeting on Feb. 14 to talk about the Park Avenue study. Highway 9 transitions into Park, and is under the oversight of Colorado Department of Transportation. The department requires an engineering study before construction is done. Wolfe said that fixing traffic on Park was always part of the discussion for parking issues in Breckenridge. Mamula added that the studies that have been done have taught the town council about the habits of drivers in Breckenridge and how they use parking in town. The study will help the town council to decide how to move forward after the letter from Buhler, and where the next best spot would be for a potential parking garage.